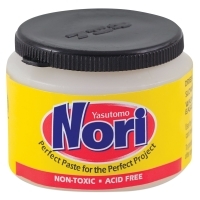 Nori Paste is an excellent paper glue for a wide variety of school and home arts & crafts projects, including collage, egg craft, card making, and scrapbooking. It adheres even delicate papers and tissues to glass, plastic, and metal and will not soak through fabrics. Slow to dry, it can be easily repositioned while wet. 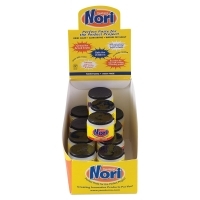 This versatile glue dries clear, does not leave any sticky residue, won't stain paper, and washes off easily. It can be diluted with water, is acid-free and non-toxic. Note — Nori Paste is not recommended for use on vellum, plastic, or metal.